The Columbia River Gorge is one of the most attractive landscapes you’ll ever see (indeed, it’s a National Scenic Area for a reason). 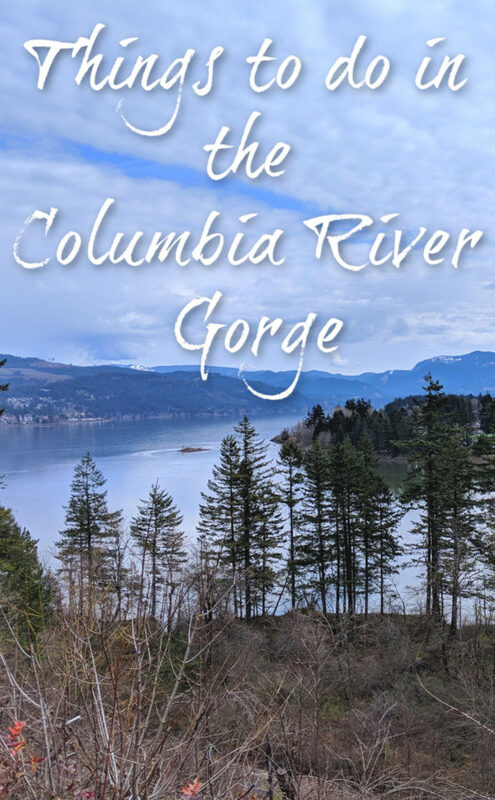 The Columbia River meanders its way through the Cascade mountain range and creates a dramatic backdrop along the way – towering mountains, blue water, waterfalls, and hikes and nature around every corner. But what makes visiting the Columbia River Gorge especially spiffy is that it’s easy to get to and easy to enjoy. 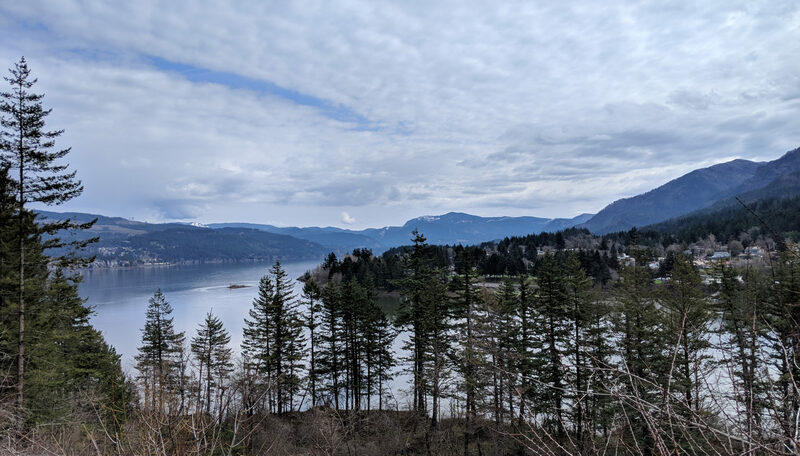 I’m sure there are grand hikes to take that require some effort to get to, but for the most part, there’s a lot of amazing things to see right off Highway 14 in Washington and I-84 in Oregon (the two roads that travel along the Columbia River). The ease of getting around has become more important to me in my momlife and made this one of my favorite spots to go with Little Monster. After all, there are few things Little Monster loves more than rocks and trees and pine cones at the moment. Important note: If you stay on the Washington side like we did, you’ll be taking toll bridges back and forth to Oregon. Here are some of our favorite things to do that work well no matter the age of your kids. We did not do much hiking with Little Monster (see comment about rocks and pine cones above. She can’t go more than three seconds without stopping to examine stuff on the ground so longer hiking trails are not necessary). However, there are tons and tons of hikes in the area. Easy ones to reach include parts of the Pacific Crest Trail (maybe you’ll even come across through-hikers and can ask them to tell some hiking tales) and Beacon Rock State Park on the Washington side. 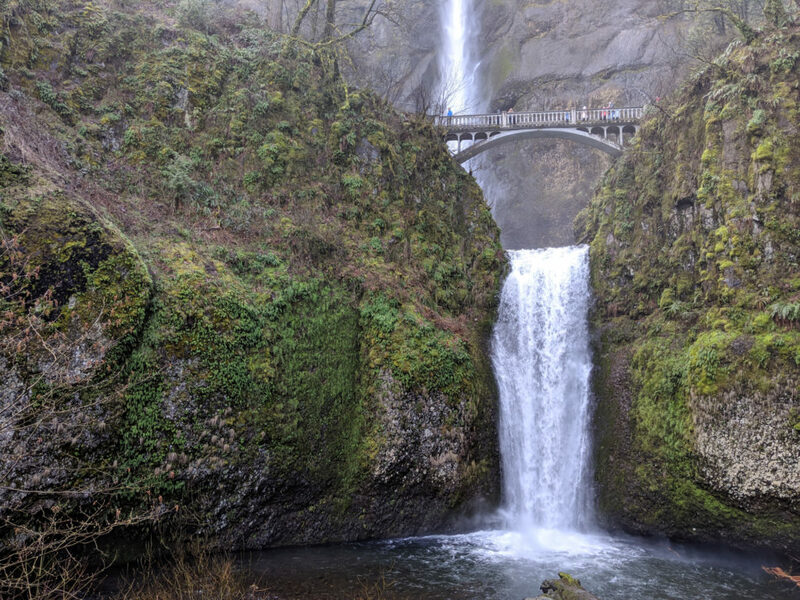 On the Oregon side, Mosier Plateau Trail is great for wildflowers in the spring, and I’m partial to hikes around waterfalls like Wahkeena Falls and Horsetail Falls. There’s about 500 more feet of waterfall above the top edge of this photo. If you visit the Columbia River Gorge and you don’t go stare at a waterfall, you’re doing it wrong. For one, they’re everywhere. For two, they often are just off the road and require little work to get to. For three, they are super duper pretty. The granddaddy of all the local waterfalls is Multnomah Falls, which tops out at about 611 feet. It’s a whole lotta waterfall! But it’s extremely easy to get to off of exit 31 on I-84. You can see the entirety of the falls within just a few steps of the parking lot, or you can take the very short walk up to the bridge that crosses over a break in the falls (lean over and look down if you dare). There’s a lodge with a restaurant, shop, and restrooms, as well as a snack shack right there as well. There’s another short half-mile hike you can take to nearby Wakeenah Falls, which are 240 feet high. And just a couple minutes down the Historic Columbia River Highway, which is adjacent to Multnomah Falls’ parking lot, you’ll come to Horsetail Falls, which is a petite 176 feet high. These waterfalls are all very easy to get to, but there are plenty more in the Gorge to find, but few that offer as much waterfall bang for your buck as this cluster. There are many small towns to explore in the Columbia River Gorge, but the one that we think is the most fun all around is Hood River, Oregon. Again, it’s all about ease of visiting. Hood River has got it all within walking distance, which is my kind of place since I can’t go more than three steps without stopping for my toddler to investigate a leaf on the ground. 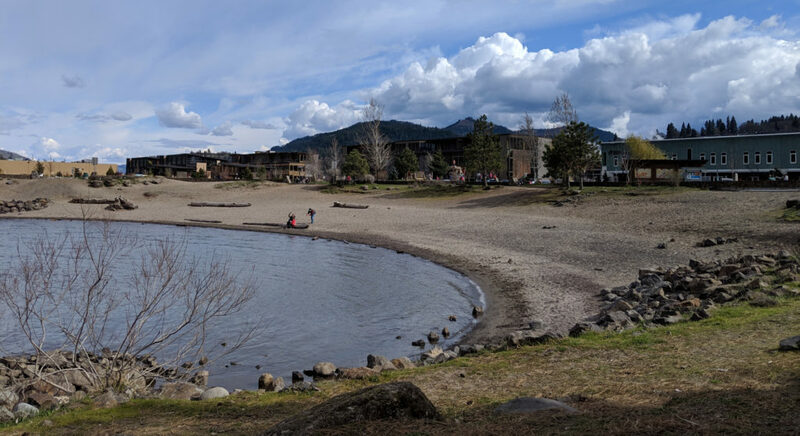 There’s a strip of local shops to explore (including a toy store) if you don’t have a toddler who wants to touch everything, but where it’s really at is down by the water surrounding Hood River Waterfront Park. Kids from toddler age on up will enjoy the playground right on the water, and there’s a sandy beach too. In warmer weather, you can even play in the water (or go windsurfing, if that’s your thing, as Hood River is the windsurfing capital of the world). Along Portway Avenue, the street in front of the park, you’ll also find a lineup of trendy restaurants, including Solstice Pizza, Cicci Gelato, pFriem Family Brewers, and others. We enjoyed a pizza while Little Monster played in the kids area at Solstice. The beach in Hood River is right next to the playground which is also right next to several restaurants. Nothin’ wrong with that. While most of the Gorge is all about natural appeal, there are a few things to do beyond trails and waterfalls. The Columbia Gorge Sternwheeler is one of the best. This riverboat cruise leaves out of Cascade Locks on the Oregon side between May and October, and out of Portland from November through April. 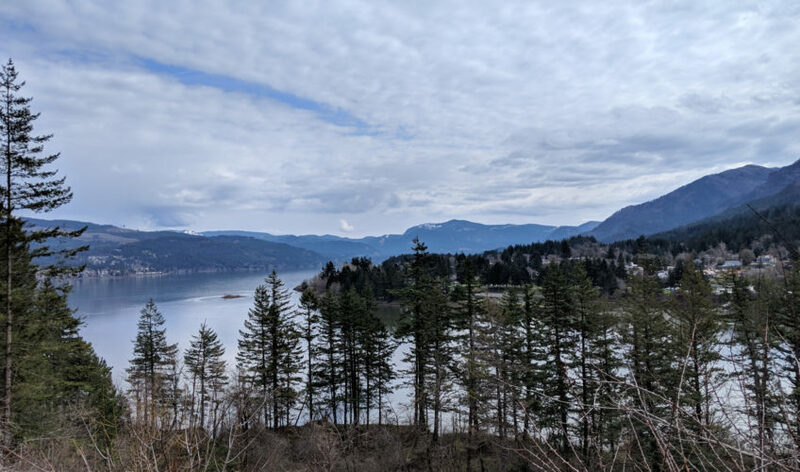 The cruise goes from Cascade Locks to the Dalles and is a fine way to enjoy the amazing scenery in the area, but also to learn more about the tribes that call the area home and the history of the land around you. These two attractions are side by side. Visit one, visit both, choose your own adventure! Both are free. Visit the dam and you can watch salmon make their way up a fish ladder (mostly seasonal), watch boats go through the lock in the summer, learn about the dam’s history and hydroelectric power, or hike a trail. We visited the fish hatchery as that sounded up our alley. This place is perfect for toddlers and young children. For one, it opens at 7 a.m. which was ideal for us as Little Monster doesn’t sleep on vacation and was up very early. The experience is unguided so take as much or as little time as you want to look around. Peep into pools where baby salmon and steelhead are being raised, or visit in the fall to see adult fish spawning. But the best part are the ponds. 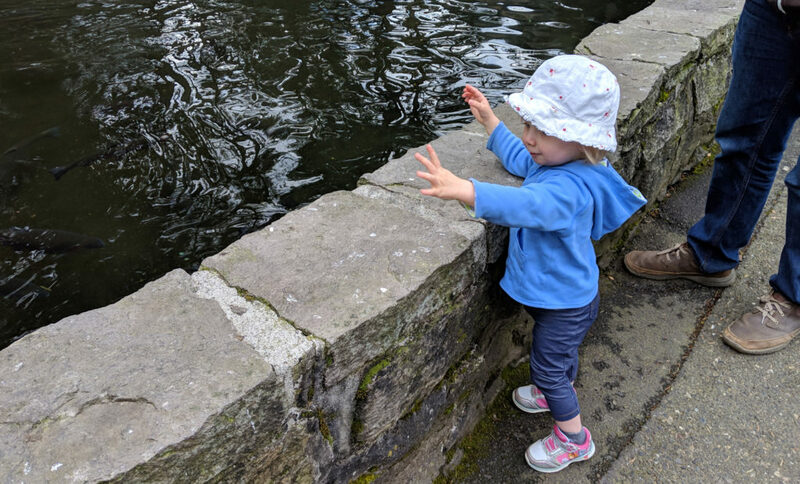 Find the trout ponds where you can feed the fish with food you buy from a machine (bring quarters!). The hatchery is serene and tossing little food pellets to eager trout is surprisingly fun. Also visit the sturgeon pond and viewing center. If you don’t know what a sturgeon is, they are pretty much dinosaur fish. They’re huge and have survived on this planet for millions of years. The largest one in the pond is named Herman and he’s 10 feet long, weighs 500 pounds and is nearly 50 years old! Feeding trout at the Bonneville Fish Hatchery = fun. You’ll spot Lewis and Clark Trail signs all over the place, especially on the western side of the Gorge. Stop and read some plaques. Kids love when adults stop to read plaques. Near Skamania Lodge in Stevenson, Washington, is also the Columbia Gorge Interpretive Center, which is an excellent museum that delves into the history of the Columbia River Gorge starting from its geology, through its Native American History, up to modern times. There is an admission fee. I skipped this one due to the season we most recently visited, but if you visit in later spring or summer, driving the Fruit Loop in Hood River is a stellar way to connect with the local food scene. The Fruit Loop is 35 miles long and takes you through orchards, farmland, lavender fields, and little communities. Along the way, stop at a winery, take the kids berry picking at one of the u-pick farms (or just buy some berries if your kids are too young or too free spirited to pick fruit), or stop to buy some fruit or lavender from a farm stand. For the kids, watch for the Apple Valley Country Store, which has milkshakes, or The Old Trunk, which sells antiques, art, and gifts, but also has a kids area.